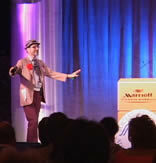 A Keynote Speaker with Substance or an Ultra-Fun Motivational Speaker? Roger Reece is the perfect keynote speaker with substance. His speaking style is dynamic and yet natural and down-to-earth. He will engage, challenge and connect with your audience, delivering a powerful motivational message. He will also morph into his alter-ego, Buford P. Fuddwhacker, and take over the stage with outrageous motivational humor and audience participation. Get ready for a high-energy extravaganza of disco music, kazoos and hilarious, down-home country humor. 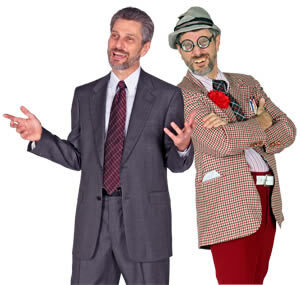 You may not be able to find it all in one keynote speaker, but why should you try when you can have the motivational-speaker team of Roger Reece & Buford Fuddwhacker? The contrast between Roger and Buford is so extreme that you won't believe they're the same person. Buford generally opens the program with a 50's rock & roll music grand entrance, recruiting the entire audience as his kazoo back-up band. He then proceeds to deliver a motivational speech with the help of "volunteers" from the audience, who join him on the platform for onstage antics guaranteed to bring the house down. 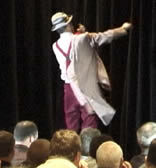 Then Buford wraps up his opening and morphs into Roger Reece, who takes over the show. The radical transformation from Buford to Roger is both a surprise and a revelation as Roger builds his keynote on key points from Buford's opening. He stresses the importance of a positive attitude and the ability to shift awareness and change behavior. The keynote is customized to focus on your conference theme or the key topic you want to drive home to the audience. Then Buford returns to wrap up the program with a grand finale of high-energy motivation, music and audience participation. The result? A uniquely effective blend of entertainment, motivational humor and substance. It's like getting two distinctly different motivational speakers for the price of one. Buford Fuddwhacker is the classic old-time pump-em-up motivational speaker with the fervor of a fired-up, down-home country preacher. Within the first few minutes after he makes his grand entrance, the audience realizes it's time to suspend their disbelief and just go with the flow - and the fun. Buford's "list" contains the names of key people in your audience, and it's not uncommon to see him bring CEO's, board members, top managers and popular team members to the stage for hilarious stunts and interaction. The focus is always on positive attitude, teamwork and personal motivation as he makes your audience members the stars of the show. We've all seen motivational speakers with tons of hype and very little substance, and Buford plays his role to the hilt. He's a down-home country philosopher, inventor, computer nerd and salesman who is on his way to becoming a world-renowned motivational speaker. Watch in amazement as he transforms your meeting room into a motivational pep rally, with disco, rock & roll, singing, dancing and a laughter-filled, tongue-in-cheek motivational message. 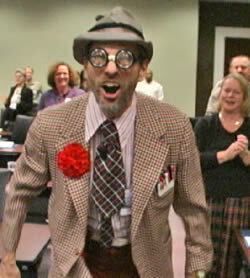 Whether playing the role of Buford Fuddwhacker or just being himself, Roger Reece infuses his keynotes with energy and passion. He's passionate about human potential and the capacity for motivated teams to produce phenomenal results. Whether he is speaking on the topic of Leadership, Productivity, Achievement, Personal Growth or Teamwork, his enthusiasm is contagious. Roger is an accomplished motivational speaker and a successful businessman with an MBA and over 25 years of corporate executive management experience. 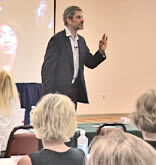 He speaks from a wealth of personal experience and often shares personal stories to illustrate his points. 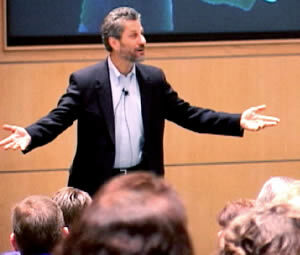 His messages are practical, and they always challenge audiences to take an attitude of ownership in everything they do. If there is any single word that describes Roger Reece's keynotes, it's "engaging." Regardless of the length of the keynote (generally 45-90 minutes), audiences are fully engaged from beginning to end. This is partially due to Buford Fuddwhacker's unconventional approach to humor and motivation. But even when he leaves Buford at home, Roger's ability to connect with and engage his audiences is immediately apparent. His powerful presence, his sense of humor and his strong motivational message content place his keynotes in a class far above the expectations of most audiences. Because he has a hard time getting dates, Buford often takes advantage of a keynote opportunity to select a lucky woman from the audience to be his date. 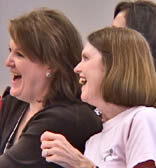 Three people are selected from the audience to compete in a DISCO fashion show and positive attitude contest. 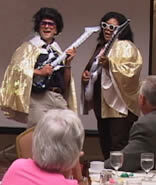 Buford recruits two Elvis impersonators to audition onstage for a TV commercial for his latest invention. 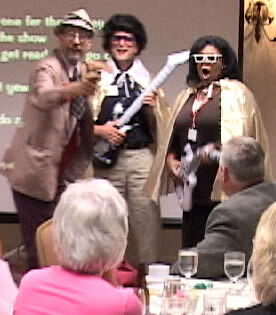 Buford writes parody lyrics to popular songs - custom lyrics specific to your conference, organization or event. 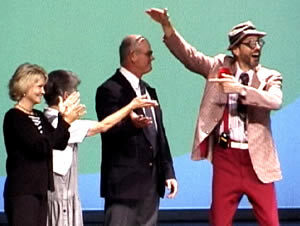 The lyrics are coded in Karaoke format, and during the keynote, Buford recruits singers and dancers to join him onstage to sing the conference theme song. Perfect for awards banquets, Buford stages his own "Golden Bird Award Ceremony" with rubber chickens, chicken hats and festivities honoring the three prestigious award winners from the audience. Buford encapsulates Roger's keynote into a summary in the form of a karaoke song - sung to the tune of "Achy Breaky Heart." He recruits singers and dancers to sing it with him, and then turns it into a good old fashioned country hoedown. "Volunteers" are selected to assist Buford with onstage magic acts involving amazing feats such as mind reading, card tricks, rope tricks, disappearing objects, reappearing animals, pouring coffee into a hat, sword-swallowing, a sword-through-the-neck, and an arm guillotine. 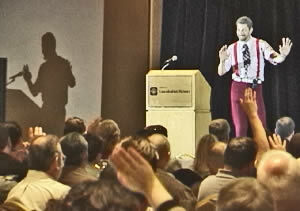 Some speakers use ice breakers to get members of the audience acquainted with one another. Buford's ice crushers have the same goal - but they go way over-the-top in terms of the fun factor. Your team members are always the stars of the show. In some cases Buford asks for volunteers. In other cases, he picks "volunteers" from the audience from a list provided ahead of time by you (the meeting planner). In every case, the result is fun and laughter. Have you ever seen your CEO onstage with an Elvis wig, gold cape, air guitar and shades? What a great photo to upload to your corporate website! What a fun YouTube video! Turn your favorite team members into superstars along with Buford at your next conference, meeting or team event! Roger Reece's programs aren't keynote speeches; they're keynote experiences. They energize and motivate people to action. They're catalysts for generating creative insights, and they inspire people to see and take on new personal challenges. Accomplishing this is not an easy task. A motivational speech with 4 key points or 5 steps to success just doesn't do it. Roger's keynotes take the members of the audience on a journey. Buford helps them to temporarily suspend their disbelief and to simply have fun. In the process, laughter carries them past negativity into a world of possibilities. Roger's message is simultaneously aimed at the head and the heart, and the fun & open atmosphere in the room helps the message hit its mark. The result is a fun and moving experience that draws people to change their thinking as well as their behavior. Prior to the event, Roger Reece will talk with you and other key members of your team about your objectives for the keynote. The key question he will ask you is this: "How would you like the thinking and behavior of the audience members to change as a result of this keynote?" Your objectives will be carefully woven into the fabric of the keynote experience he delivers during your event. "What's the point of this Fuddwhacker Guy?" In a word, the point is fun. Buford Fuddwhacker is a composite of characters from Roger Reece's childhood, primarily his father: a Hoosier farm boy and country philosopher, with an off-the-wall, down-home sense of humor. Buford has been appearing onstage with Roger since 1996, and he's a one-of-a-kind character. Buford is Roger's reminder not to take himself too seriously. Onstage, he reminds the audience that fun, humor, motivation and a positive attitude are universal, and they are an essential ingredient to success. But as to the question, "What's the point? "...it's simply that fun doesn't need to have a point. It just is. And it's up to all of us to have more of it every day. If you have to choose between a motivational speaker who makes audiences double over in laughter and a speaker with substance, you're looking at the wrong speakers. The right choice is a speaker with both. But of course it's hard to find all that in one person. So maybe the right choice is two speakers in one: Roger Reece and Buford P. Fuddwhacker. Contact us today to find out how we can help you make this your most successful event to date. If you've ever selected the wrong motivational speaker to deliver a keynote at an important event, you will probably never forget the pain and embarrassment of the experience. A word of advice: don't go with the cheapest speaker. Roger Reece's fees are very reasonable, but you can probably do a Google search and find someone cheaper. Not a good idea. The keynote sets the tone for your meeting. Set the tone for fun and substance with the most entertaining and effective motivational keynote speaker you'll find: Roger Reece (and Buford P. Fuddwhacker). A great way to structure your meeting or conference is with an opening keynote speaker to set the tone for the meeting and a closing keynote speaker to send everyone home on the right note. 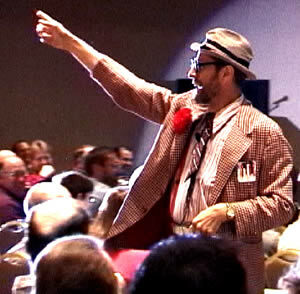 You can bring Roger Reece (and Buford Fuddwhacker) in as your opening keynote speaker or your closing keynote speaker. But why not have Roger and Buford open and close your event? With an endless array of keynote options, Roger will structure opening and closing keynotes that bring a seamless integration to the event. 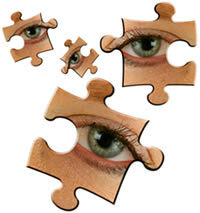 You can even include one or more concurrent sessions, a team-building activity and/or an evening after-dinner program. Contact us to brainstorm ideas on transforming your event into a really memorable and successful event. If you feel like your group is too conservative for Buford Fuddwhacker, just look at our client list. Even the IRS enjoys Buford's humor. Maybe it's time to lighten up and crank up the fun factor. If last year's speaker was a dud, don't do it to them again... crank up the fun factor with the Roger & Buford tag team. Ok, so the economy is not doing so well, and maybe you have to announce some bad economic news during this meeting. All the more reason to avoid a somber keynote speaker. Let Buford crank up the fun factor and let Roger deliver a message on Embracing Change. Balance your bad news with humor, motivation and a positive attitude shot in the arm. Every meeting comes off better when your audience is having fun. Make this event a fun, enlightening, enjoyable and memorable experience. Contact us for Roger Reece's fees, availability and a link to online videos.